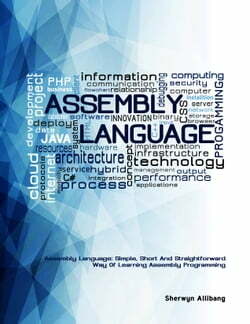 This book is intended for beginners who would like to learn the basics of Assembly Programming. This book uses Simple words, Short sentences and Straightforward paragraphs. The triple S way to learn Assembly Programming. The topics covered in this book includes a brief introduction to assembly,... read more common arithmetic instructions, character and string input and display routines, flow controls including conditional and looping statements, stack, and procedures. This assembly language book is intended for complete beginners in assembly programming. However, it is assumed that the reader has prior or basic knowledge with other programming language. This book includes screenshots of step by step of how to code, compile, link and run assembly programs. This book is packed with working sample assembly programs and after reading this book, the reader would be able to develop assembly programs based particularly from problems given in computer science courses.